The Charter of Madinah in two parts, the first part dealing with the rights and obligations of the Mohajirs and Ansaar of Madinah (Clauses 1-24) and the second part dealing with the rights and obligations of the Jews, their clients and friends, pagans, polytheists and other inhabitants of Madinah. 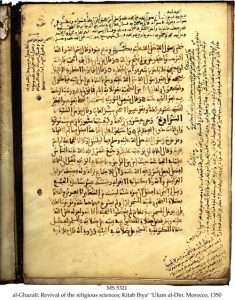 The original Arabic text of the Charter has been translated in different ways and versions. The version I have selected for analysis in this essay consists of 49 clauses. The date of the Charter is not confirmed but it is generally believed to be 623 ADS, before the Battle of Badar. 1. This is a document from Muhammad, peace be upon him, the Messenger of Allah, to the believers and Muslims from Quraysh (Makkah) and Yathrib (Madinah) and all those who followed, joined and laboured with them. They constitute one Ummah distinct from other people. 3. Banu Auf, according to their former condition, shall pay the blood-wits within their number and each sub-clan shall redeem their prisoners with the kindness and justice common among the believers. 4. Banu Harith from Al-Khizrij, according to their former condition shall pay the previous blood-wits within their number and each sub-clan shall redeem its prisoners with the kindness and justice common among the believers. 4. Banu Saidah, according to their former condition, shall pay the previous blood-wits within their number and each sub-clan shall redeem its prisoners with the kindness and justice common among the believers. 6. Banu Jasham, according to their former condition, shall pay the previous blood-wits within their number and each sub-clan shall redeem its prisoners with the kindness and justice common among the believers. 7. Banu Najjar, according to their former condition, shall pay the previous blood-wits within their number and each sub-clan shall redeem its prisoners with the kindness and justice common among the believers. 8. Banu Amir-bin-Auf, according to their former condition, shall pay the previous blood-wits within their number and each sub-clan shall redeem its prisoners with the kindness common among the believers. 9. Banu Nabith, according to their former condition, shall pay the previous blood-wits within their number and each sub-clan shall redeem its prisoners with the kindness common among the believers. 10. Bani Al-Aus, according to their former condition, shall pay the previous blood-wits within their number and each sub-clan shall redeem its prisoners with the kindness and justice common among the believers. 11. The believers shall not leave any one destitute among them by not paying his redemption money or his blood-wit in kindness. 12. A believer shall not take as an ally the freedom of another Muslim without his consent. 13. God-fearing believers shall be against anyone who rebels or seeks to spread injustice or sin or enmity or corruption amongst the believers; they will be against him jointly, even if he were the son of any one of them. 14. A believer shall not kill a believer for the sake of an unbeliever nor he shall support an unbeliever against a believer. 15. Allah’s protection is one and is equally extended to the humblest of the believers. The believers are friends to one another to the exclusion of others. 16 Whosoever of the Jews follows us, he shall have our help and equality: He shall not be wronged nor shall his enemies be sided against him. 17. The peace of the believers is indispensable. No believer shall make peace to the exclusion of others in a fight in the way of Allah except on equality and justice among them. 18. In any military expedition made with us the parties shall take turns with us. 19. The believers shall avenge the blood of another shed in the path of Allah. 20.The God-fearing believers enjoy the best and the most upright guidance. 21.No polytheist shall take the property or person of Quraysh under his protection nor shall he intervene in his favour against a believer. 22.Whosoever kills a believer without a just cause shall be subject to retaliation, unless the representatives of the murdered are satisfied with blood-wit. The believers shall be against the murderer as one, and nothing is permissible to them except to take action against him. 23.It is not permissible for a believer who approves what is written in this document and believes in Allah and the Day of Judgement to help an evil-doer or shelter him. On the Day of Judgement, the curse and anger of Allah shall be upon him who helps and shelters him. 24. Anything which you may disagree upon is to be referred to Allah and Muhammad (peace be upon him). 25. The Jews of Banu Auf are an Ummah with the believers. The Jews have their own religion and the Muslims their own. This applies to their clients and to themselves with the exception of anyone who does wrong or acts treacherously, he brings evil on himself and his family members. 26. For the Jews of Bani Najjar the like of what is for the Jews of Bani Auf. 27. For the Jews of Bani Harith the like of what is for the Jews of Bani Auf. 28. For the Jews of Bani Saidah the like of what is for the Jews of Bani Auf. 29. For the Jews of Bani Jasham the like of what is for the Jews of Bani Auf. 30. For the Jews of Bani Al-Aus the like of what is for the Jews of Bani Auf. 31. For the Jews of Bani Thalabah the like of what is for the Jews of Bani Auf with the exception of anyone who does wrong or acts treacherously, he brings evil on himself and his family. 32. Jufta, who are a sub-clan of Thalabah are like themselves (Bani Thalabah). 33. For Bani Shatbah the like of what is for the Jews of Banu Auf. Piety and loyalty stand in the way of treachery. 34. The clients of Bani Thalabah are like themselves (Bani Thalabah). 35. The close friends of the Jews are like themselves (Jews). 36. None of them are to go to war (military expedition) without the permission of Muhammad peace be upon him. 37. He shall not be prevented from seeking vengeance for wrongdoing when this involves him and his family members except where a man has been wronged. God will guarantee this agreement. 38. The Jews shall bear their own expenses and Muslims their own. Each must help the other against anyone who attacks the people of this document. They must seek mutual advice and consultation. And loyalty is a protection against treachery. 39. A man is not liable for his ally’s misdeeds. The wronged must be helped. 40. The Jews shall contribute to the expenditure of war as long as they continue to fight alongside of the believers. 41. The interior of Yathrib shall be sacred for the people of this document. 42. A protected neighbour is as sacred as the protector himself as long as he does not harm and does not act treacherously. 43. A woman shall not be given protection without the consent of her family. 44. If any dispute or controversy is likely to cause problem or trouble among the people of this document, it must be referred to Allah and Muhammad the Messenger of Allah. Indeed, Allah will guarantee the observance of this document. 45. The tradesmen among the Quraysh should neither be given protection nor support. 46. Between them is help against whoever suddenly attacks Yathrib. على كل أناس حصتهم من جانبهم الذي قبلهم. 47. When they are called to make peace, they conclude and accept it; they, in turn, call for reciprocity. It is for them upon the believers whosoever fights for religion. Everyone shall have his portion from his side. 48. The Jews of Aus, both their clients and they themselves, are in the same position as belongs to the people of this document in pure loyalty from the people of this document. Loyalty is a protection against treachery. He who acquires it for himself should do so. Allah is the most upright and trust fulfiller of what is written in this document. 49. This written document will not protect the unjust and the sinner. The man who goes out for fighting is safe and the man who stays in the city is safe, unless he has been unjust or has sinned. Allah is the protector of him who is good and God fearing and Muhammad, peace be upon him is the Messenger of Allah.